In 2010, the then-leader of the opposition in Dáil Éireann (lower house of Ireland’s parliament), Fine Gael’s Enda Kenny, announced that he and his party favored abolition of Seanad Éireann (upper house of Ireland’s parliament) and would hold a referendum allowing the Irish people to have their say on the matter if they were in the next government. This represented a u-turn from the current Taoiseach’s (Irish prime minister) statement a year earlier, when he noted that the Seanad had “real potential.” Now, the Fine Gael-Labour government will hold a referendum on Seanad abolition in October. Before considering the merits of the issue and the referendum campaign that has recently commenced, this already has been an extraordinarily cynical political exercise. Enda Kenny’s announcement that his party would seek to abolish the Seanad took his colleagues by complete surprise. Its timing, though – in the days when Labour leader Eamon Gilmore was widely regarded as outclassing Enda Kenny in the Dáil and many Fine Gael advisors were privately and publicly urging him to “be bold” – was no accident. Moreover, at a time when the Irish people are understandably apprehensive and demoralized, what could be more appealing than the prospect of “firing” sixty politicians? The truth is that politicians of all stripes failed the Irish people during the boom. Yet a conscious and deliberate undertaking to make and keep a promise to the electorate by exploiting its anger is sheer populism of the very worst kind. Finally, the government know well that the referendum on Seanad abolition will distract attention from the divisive, emotive debate on abortion and the still stagnant economy. That the referendum will be held in October, just before the details of another painful budget are released, is no accident. With this as context, what exactly is the government’s argument for Seanad abolition? The focus thus far has been on criticizing the institution as it is now. And it is very difficult to defend the present Seanad. 11 of its 60 members are appointed by the Taoiseach; 6 are elected by constituencies comprised of graduates of Trinity College Dublin and the National University of Ireland; the remaining 43 are elected to vocational panels by parliamentarians and by local councillors around the country. It plays an advisory and revising role and cannot veto, only delay, decisions taken by the popularly elected Dáil. It is admittedly open to charges of being an inherently undemocratic and toothless institution. That said, many towering figures from this country’s history have served in the Seanad and left an indelible mark upon it. W.B. Yeats, Mary Robinson and David Norris are just a few of them. The more free-flowing and wide-ranging discourse in the upper chamber have enriched Irish democracy. The role of the Seanad in reviewing legislation is an important one. Advocates for the huge numbers of people struggling with unprecedented levels of personal debt praise the scrutiny the sitting Seanad has given the lengthy Personal Insolvency Bill over the past number of months. As it seeks to abolish the Seanad, the government also claims that it will reform the Dáil. The reforms that have been mooted thus far are piecemeal and don’t get at the real problem. That problem is the ridiculously over-rigid party whip system. If TDs (members of Dáil Éireann) from the government parties dare to defect from their leadership on just one vote, they lose the party whip and are banished to the political wilderness. As such, whipped TDs, especially when a government has a large majority, simply carry out the will of the executive. There is little prospect for truly holding the executive to account. The more independent voices in the Seanad have traditionally endeavored to do so. And ensuring greater executive accountability will be one of the primary objectives of a reformed Seanad. 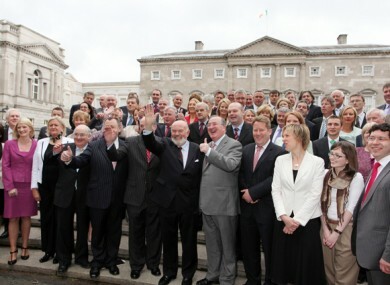 What will a reformed Seanad Éireann look like? The imaginative and thoughtful proposals emanating from the leadership of Democracy Matters Ireland, the group leading the fight to oppose the government’s abolition drive, will guarantee that a renewed Seanad will reflect the realities of living in Ireland in 2013. There will be equal numbers of men and women. The salary will be 50% of what TDs are paid. There will be no special role for parliamentarians in the nominating process. There will be a cap on campaign and election expenses. These proposals will allocate important new powers to the Seanad. They include: the power to examine draft European Union regulations and directives; the power to review certain types of statutory instruments; the power to scrutinize ministerial appointments to public bodies; the power to hold limited forms of public inquiries; the power to inquire into the need for new legislation in certain areas; and the right of the people, on a petition of 1,000 signatures, to force the Seanad to debate an issue of national importance. Crucially, these proposals will make the Seanad more democratic. The franchise will extend to people entitled to vote in other elections; to all residents of Northern Ireland who are eligible for Irish citizenship; to graduates of all third-level institutions in Ireland; and to Irish passport holders living abroad. The inclusion in these proposals of a right for the global Irish diaspora, at last, to have a say in the affairs of a country they love so much, yet had to leave behind, may be the most compelling reform of all. And I hope that the potential for Irish passport holders abroad to vote in Seanad elections – in tandem with the manifest strength of the case for reform and the equally manifest weakness of the case for abolition – will animate the diaspora to champion the cause of Seanad reform. Irish political leaders are fond of mouthing platitudes about learning from the diaspora and involving successful people who’ve left in policy formation. This is something far more real and concrete, however. There is no doubt that this campaign will be a difficult one. People here are hurting and angry. I understand and respect how they feel. But I don’t believe abolishing Seanad Éireann will improve their lives or improve Irish democracy. I believe a renewed Seanad and the invaluable “second opinion” it can provide are worth fighting for. I plan to spend the next few months doing just that. I hope you’ll join me. More details are at www.democracymatters.ie.